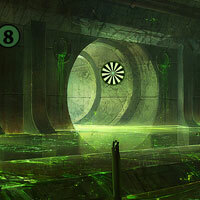 WowEscape - Wow Second World War Sewer Escape is another point and click room escape game developed by Wow Escape. In this game, you came to see a old sewer to do some research work. But unfortunately you are trapped inside that sewer. No one is there to help you. You have to escape from there by finding useful objects, hints and solving puzzle. Click on the objects to interact with them and solve simple puzzles. Good luck and have fun! hey you two...there is a crafty black beetle hiding in the scene with the pink 4...lower middle right. Hi Zuleika! Still stuck with key... where to use wooden stick? the scene with the pink 4 and use for key are found after placing the 5 green fuzzy hearts above tunnel. In same place as you guys. Haven't found room with pink 4 yet. Need one more heart. Have key but nowhere to use it - also wooden stick. Have used wrench but still in inventory. sneaky green cone thingy found in room with cyan 5...lower left at waterline. Found sneaky worm in scene with 6 frogs. Place in scene with face masks for last heart. Lots of hotspots in new scenes - give those odd coloured 'lava lamp objects for start scene. Also have knife, strange object like melted chess piece ( need 3 more ) and some more puzzles. @ joycy: It's on the mid-right of the scene - neat the back wall of the sewer. I have one bug, 1 stick/log, still have spanner/wrench/tool although used once. And I don't have any clue for the 6 gold circle puzzle. cate, pleased to hear it :) anything else? @zuleika...have you found all of the green cones and placed them? that was my 4th chess piece. @yvonne...pretty low key...made lamb, drank too much wine, gave myself a facial. @yvonne, but you would have loved the river...it was a beautiful day. Cate - do you remember where all your chess pieces were - I only have 3 but one of those is your 4th one...so I must be missing one of the others!!! @cate: no I still need 3 cones. Wow - I am so useless at these....I still only have 3 of the 5 lava lamps. joycy did you get the one in start scene? okay, zu, so you'll get the last one when you find those three...let me go back to try to remember. Joycy.. did you find the one in frogs scene? There was a sneaky cone in the top LH corner of the first scene, I seem to remember. yep, zuleika...it was monday and yvonne was my "virtual" celebratory partner. poo, zuleika, i wasn't fast enough with the posting. @joycy: do you have a hammer head? I am missing my pink lava lamp. Any suggestions? monica, the pink lava is in scene with pink 4...also orange one...one to the left brick and one to the right brick. Any ideas about where to use paintbrush? The only one I could possibly have missed is on right vent in scene with crate. But I have studied that scene over and over in full magnification and with brightness turned up - nothing there. Don't know what's up here. still no clues for 6 golden circular symbols. Have swapped coloured buttons on circle round to order but without knowing where 1 starts it doesn't seem to be working. monica, the dust brush is used on lower part of column that is discolored...where the tunnel veers off to the right. monica, i think that clue came from placing the green and gold brooch that you got from banging wood into barrel. LOL!!!! Just put wood into barrel - was expecting to get a hammer! Thanks again cate : ) I've scoured that far right tunnel like a demented PI for ages now. I will have to let it go this time. just played again and it's in the far right duct/tunnel at about "2 o'clock" from the bag on the ground. lol, zuleika, i'm so frustrated for you...and, i'm sorry it is hiding from you...if it's any consolation, your company is always enjoyable and looked forward to...sorry it was such a bust. joycy did you see clue? cate look forward to playing with you :) have a good evening, good night. oh nooo, joycy...mine did the same thing right at the end...and, it's odd, because i've never had a problem before.if you were at the colored balls puzzle, you were pretty much at the end. Ack! Heeelp, stalked you all until we found the lava lamps, then whisked through until ... after doing the color wheel and filling in numbers from the colored dots along the way ... I have a rod or stick in inventory, no idea where to use this?? Feels as if I'm near the finish but, where IS the finish? Thanks for leaving good hints! Carrie, from the last scene, go in the small circle on left side, and use on left tube there. it cuts it open and lets you out :) took me a while to find it. Careful with the greens in the colour wheel at the end. Mine didn't work until I swapped the the 8 and 1. Very good game. Reminded me of old Ainars games in some ways - probably the settings. Thank you everyone for the hints left here - especially where to use the paintbrush and where that last cone was ( in the cyan 5 tunnel). Good fun!